I mentioned that I immediately made a second quilt in this same design, right? I had such fun putting that last one together that I decided I should really see how it looked in Rifle Paper co’s newest line, Menagerie. This one has a different feel with these darker colors, and I think it’s quite perfect for Fall. My sister took one look at it and said it made her feel sad, but I don’t see that at all. (What does she know, really?!) I love the florals on the darker backgrounds and really enjoy the addition of the gold metallics in many of the fabrics. 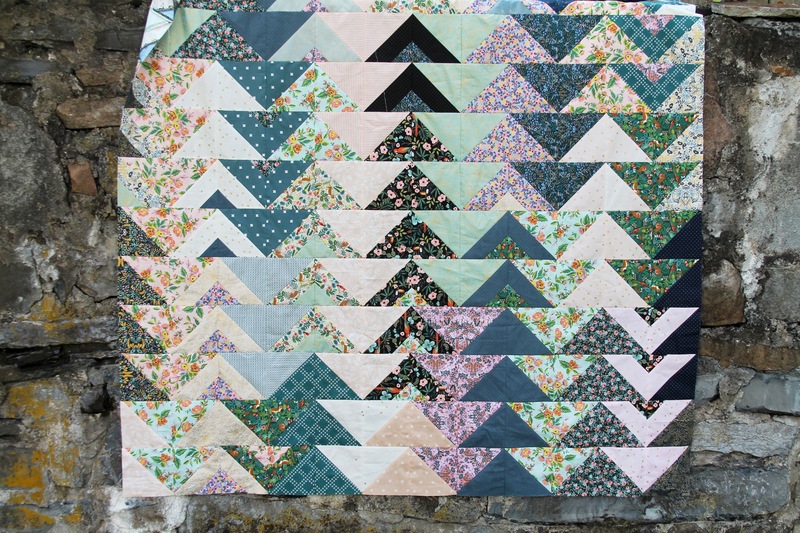 This time I added some extra triangles to a few of the hst blocks, giving me a chance to mix and match the fabrics even more and giving it a bit of extra interest. I’ve already made a backing for this one, and hope to start quilting it soon, so hopefully I’ll have finished photos before too long! 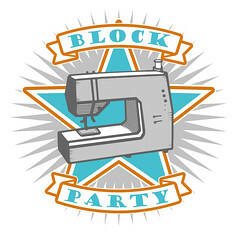 This entry was posted in Fabric, Posts about Quilts and tagged cotton + steel, handmade, hsts, menagerie, quilt top, rifle paper co. Bookmark the permalink. 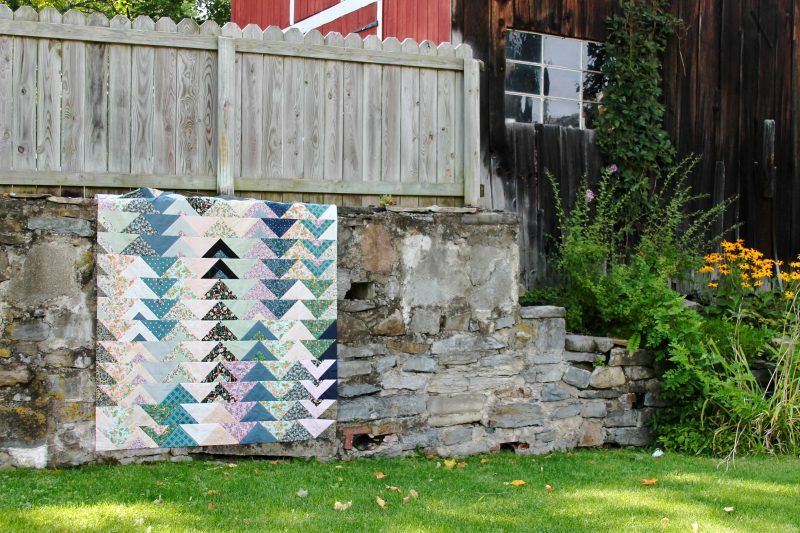 a reject project turned quilt. 19 Responses to deja vu? Of course, your sister does not know. Mine wouldn’t either. 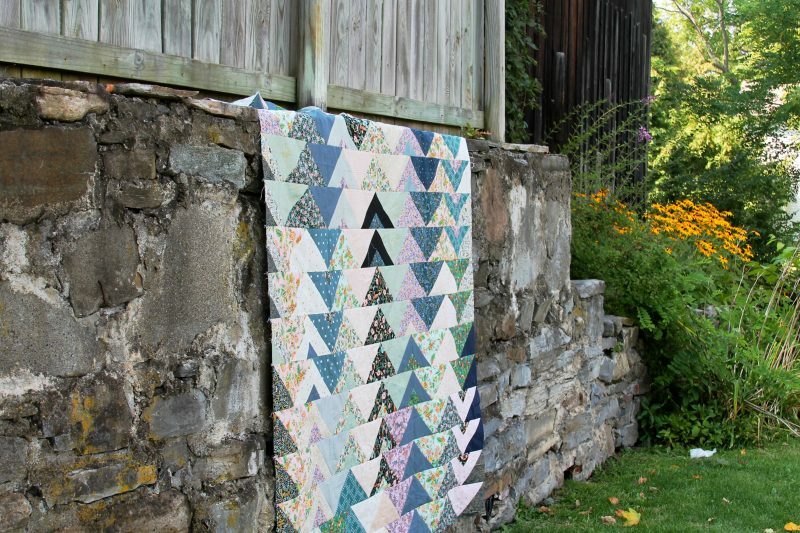 Lovely quilt top! 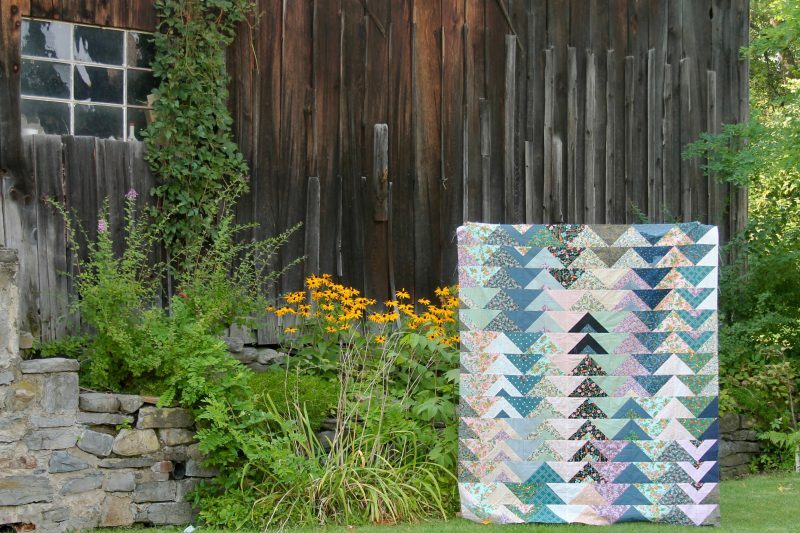 Great backdrop for this quilt. It’s lovely. Could you please share the name of the pattern? Thank you! It is beautiful. I don’t see sad at all. This one is a beauty. I think I prefer it to version one. This version is my favorite! 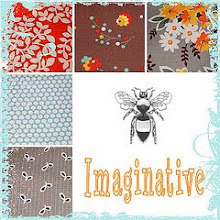 Love the colors and fabrics!!!!! Beautiful! Your color choices are so soothing and the photos against the stone wall make it look like a waterfall to me. Nice job and I can’t wait to see it quilted! I really love this blue grey version. It makes me very happy. I love this one, Ashley! It’s delicious! I’m thinking blueberry ice cream! Thank you!!! I’m so glad you are back to posting. I’ve missed your quilts. Actually don’t know how you have time to quilt. Lovely as usual! Don’t listen to sisters! LOVE the quilt! I’m another lover of Rifle fabrics, and have started “curating” (much better word than hoarding) a stash of them. 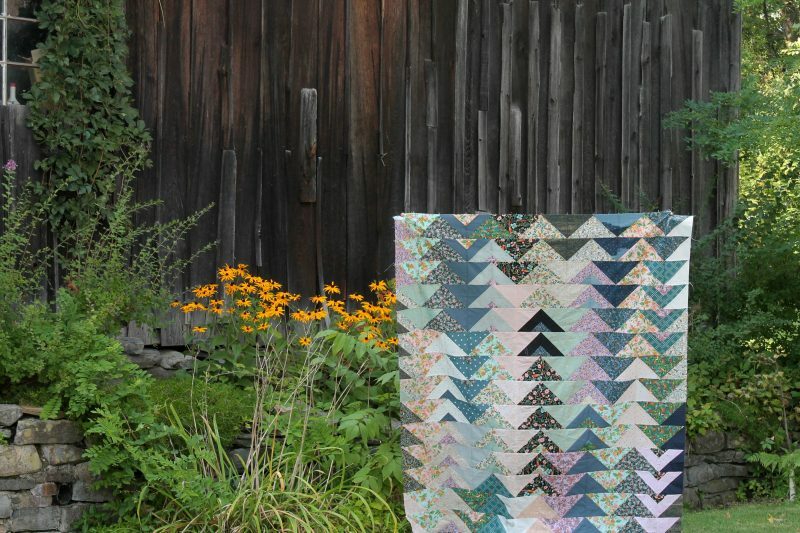 I have a vague goal of combining some of the metallics from different lines into a yet-to-be-determined semi-modern quilt. I love the colours in this second quilt! Beautiful! Oh I love those little triangle additions. Little bits that aren’t the same across a design always feel so charming to me. Lovely photos! I love this quilt. It evokes wonderful memories of swinging on a hammock curled under a quilt on a cool, fall afternoon in the mountains. This is so lovely! Beautiful muted colours. And I love your photo location!